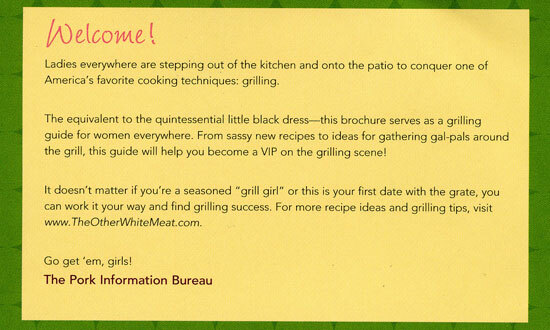 Ladies, rejoice: Thanks to the Pork Information Bureau, women can finally use a BBQ—just like men! With July 4th approaching, perhaps you’re planning for the cornerstone of patriotic party-making: the barbeque. An Americana standard, this is the sacred time when friends and family gather round the grill. Dad flips burgers, and Mom, well, she sets out the lemonade or fusses over the napkins or something. 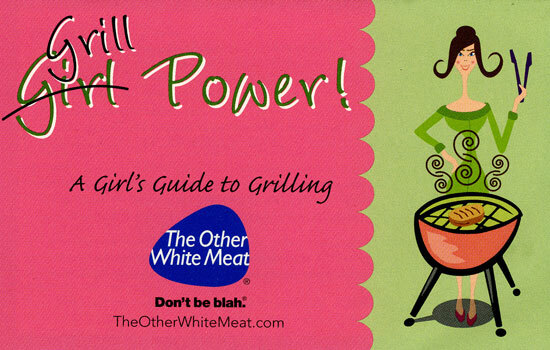 Well ladies, behold the post-feminist era’s gift to you: Now you can turn the tables on your unsuspecting spouse/lover/friend/dad with “Girl Grill Power!” a guide to help ladies navigate the open pit, presented by “The Other White Meat” campaign. 1) Confused? Just pretend your grill is a man you’re trying to romance. This pamphlet is your staple “little black dress” to ensure you look good on your “first date with the grate.” Just “work it,” and your first hangout with Mr. Char-Broil will be a smashing success! 3) You’ll probably better understand how to prepare meat for the grill if the directions are couched in a sexual metaphor. The Pork Information Bureau recommends that, when prepping your grub, you “rub it right” with the “Spicy Girl’s Dry Rub,” which you can use a little or a lot of, “depending on your mood.” Really? 4) But don’t forget about gender equity! Wouldn’t want to make your man feel like you’re treading his territory, i.e. “the grilling throne”. And of course your partner is a man, because meat grilling is something only heterosexual couples do. 5) Everything should be perfect. Always and forever. 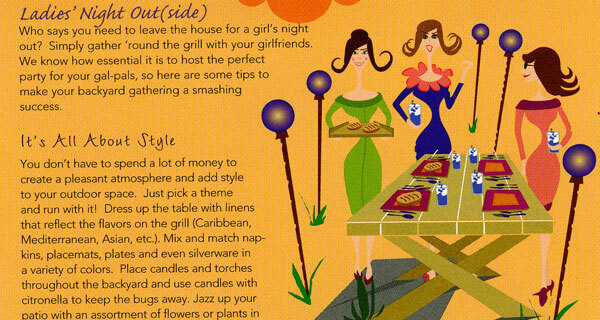 If your table is absolutely flawless, all your female friends will be double-floored by your gender-bending grill antics.